My guess is that most handwork, knitting , crochet, hooking, quilting might have a similar effect. Last night my friends met to knit. We travel from house to house on Tuesday nights just the four of us. Last night we even went out in the storm because we needed to get together. We knit together because we need to get together more than we need to knit. Last night two of us were knitting dishcloths, the other was knitting a scarf for next winter. 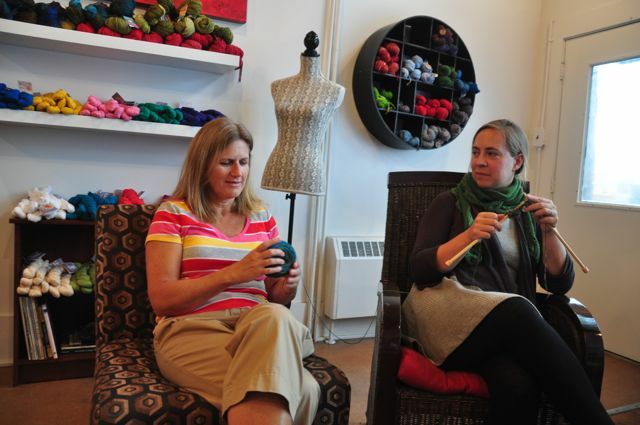 We rumbled on about the coming of summer and how we would miss knit night. It was cancelled during March break and on the Tuesday night I just felt lonely. No knit night. My knitting was right there beside me but my friends were not. I knit at home and watched tv but I missed the social. This morning I read Jan Wong’s article in the Herald about her group called sewing. She said they get together for cake and do not even sew but the real reason for the getting together is the togetherness. She talks about how important it has been for her in her move to Fredricton where she teaches at UNB. I really like her column thoughI do think her sewing group should try knitting. Knitting might be good for your physical health but I am pretty sure it also good for your mental health. It promotes gathering and socialization. It takes lonely to lovely a stitch at a time. 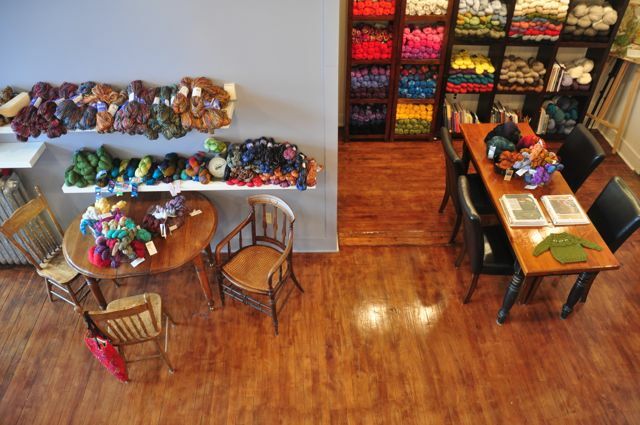 I look forward to my knitting night because it is a chance to wind down with friends. We are a tiny group and happy with that really. We don’t cook for each other. It is a no fuss kind of night. A cup of hot chocolate or mint tea might be poured but mostly in our winter of getting together what gets poured is our thoughts. As mothers we talk about our children. As women we mumble about our husbands. We share the news. I cannot say we gossip because the four of us our careful about that, but we do talk about the truth we know. We make a few plans for this or that but mostly we sit together and just enjoy the presence of another soul who likes the feel of wool slipping through their fingers, another should who knows that handmade is worth the time, not for the product , which is beautiful but for the process. We gather because we have a need for each other’s company. We could easily knit at home with netflix but our lives become richer when we can share a story. We fell less alone when we hear a story that is our own coming from someone else. I highly recommend handwork. Knit or hook or crochet or felt or quilt. It does not matter. I also believe in the beauty of doing it together. Listening, while you weave your hands together, to the sounds of familiar voices telling stories similar to your own, creating memory, lowering your blood pressure and slowing your heart rate…who knew? We all did. We so need each other…laughing, sharing, comforting, “taking lonely to lovely, a stitch at a time”…bites and beverages are available, as well! I am doubly blessed with an all-day hooking group once a month, and,what six of us call, ‘our day’, once a week…we may not have everyone every time, but we keep those days going with rare exceptions. .
Three ladies sitting, knitting. Now there’s a rug. Nicely put. I feel the same way when I attend the rug hooking group I belong to. I’m able to leave the stresses of home and work at the door and just focus on the conversation and the craft at hand. Deanne, the other day at our west Toronto (Etobicoke) gathering (haven’t been in almost 2 months because of school and work demands) someone who has attended one of your workshops came up to me and said “these look like Deanne Fitzpatrick colours”. I’m still working on the abstract rug I started at your workshop last June (almost done) with all those wonderful and colourful wools and fabrics I bought at your studio. Just thought you might like to hear that your signature style is recognized far and wide. 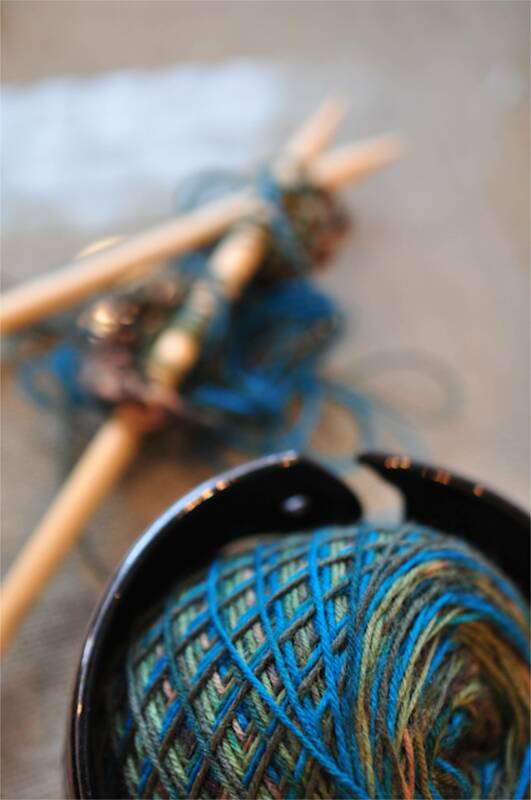 Well said Deanne…….knitting does have a therapeutic effect. And combining that with friendship can only enhance the experience. Lovely blog, so warm and comforting to read of your happy little knitting group. I must get my knitting out whilst watdhing Corrie St, Perhaps I can get a summer sweater started.?? Just digging out from our 40 cms snowfall yesterday. 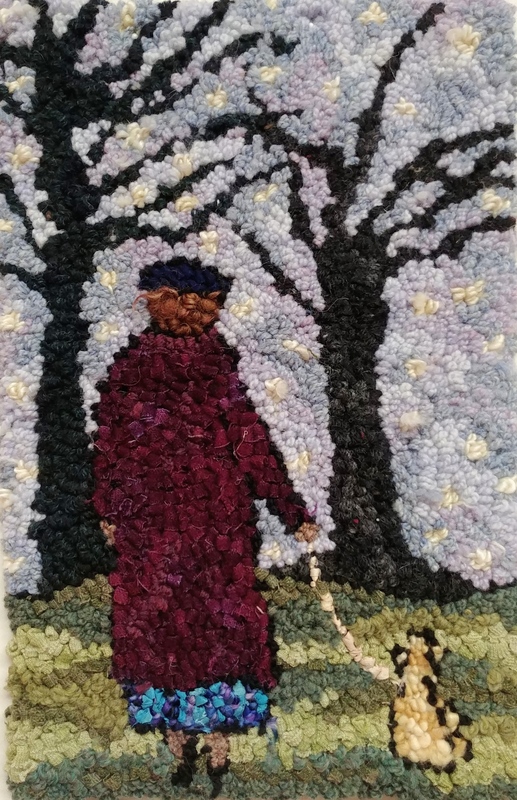 I look in at my Cheticamp frame with my soon to be completed rug as I dress for the cold , blustery weather outside and wish instead I could escape into my rug hooking, but it is not to be ….. as long as our snowplows continue to refresh our driveway with more of the white stuff. I enjoyed your blog today and closed my eyes for a few minutes thinking about sitting with friends and socializing as we work on our various projects. It was fun to do that with your help, Deanne.